You do not need a Paypal account to make a purchase. All major credit cards are accepted. "Keep Christ in Christmas" Car Magnets! 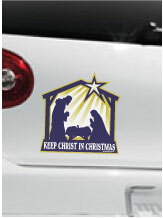 Churchmagnet.com is excited to announce our new Nativity car magnet, better known as the "Keep Christ in Christmas" magnet. We noticed a need for this item a couple of years ago, when several big box retailers decided that they may offend shoppers by greeting them with "Merry Christmas" as they walked through the door (to shop and spend money). The solution was to prohibit their employees from any mention of Christmas, and suggesting that they greet shoppers with "Happy Holidays" instead. Our answer to them is, Keep Christ in Christmas! With the Nativity Car Magnet, your church or Christian group can not only help "Keep Christ in Christmas," you can also use this as a fundraising program. 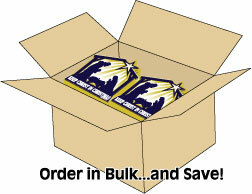 When you retail the Keep Christ in Christmas car magnet for $5, you will at least double your investment! Order 250 or more, and your profit will be $3.00 or more per magnet! These high quality magnets are produced right here in the U.S.A. Many similar items are made in China and other overseas factories, and they are simply not comparable in quality. Most will deteriorate and fade within a few weeks, while ours will remain colorful and vibrant for 3-5 years, under normal conditions. The design is a collaborative effort between Todd Turner (concept) and illustrator Mike Ray. This is not clipart! It is a totally original design which we feel captures the essence of this "Silent Night." *Magnets are 6"X6", and are printed with UV inks for outdoor durability!